This post kicks off a series of book giveaways to celebrate May as Celiac Awareness Month. May is also my favorite month of the year, green is my favorite color, emeralds are my favorite gemstones, Gemini is my preferred zodiac sign, and people with quirky personalities (Geminis) are appealing to me. These are all signs and symbols of May. 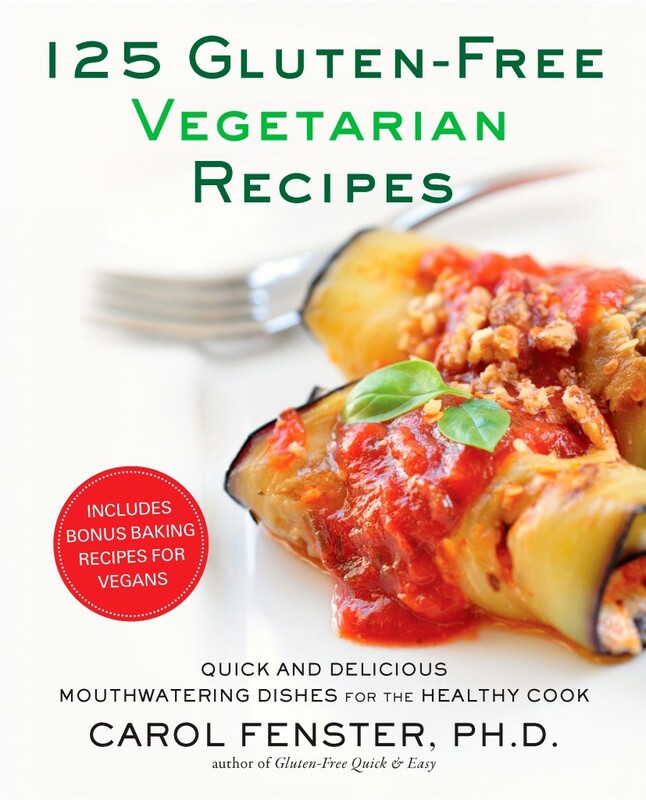 As green is my favorite color and plants are my “go-to” food source, I thought I’d kick off this series of book giveaways with a vegetarian cookbook. I’m technically an omnivore, but I lean heavily into herbivore territory. If you’re remotely interested in my take on the human genetics of food preferences, check here. To me, the whole “eat like a caveman” thing is up for debate. At least as far as the meat-heavy focus is concerned. Plants form the foundation of my diet, just as they form the foundation of the food web, or the nutritional ecosystem. In a nutshell: the sun shines. Plants (grasses) grow. Animals graze, converting the green stuff into protein (meat). Predators eat the animals that ate the green stuff that the sun magically converted into food. In most cases, and for a variety of reasons, I prefer to be part of step #3 and skip step #4 altogether. I’m a plant grazer. I’m not much of a predator. There are several reasons I’m kicking off this book give-away with Carol Fenster’s book, 125 Gluten-Free Vegetarian Recipes, plant grazing is just one of them. May (celiac awareness month), gluten-free, vegetarian, vegan, and green are the most obvious reasons, but there’s more to the story. When my daughter was diagnosed in 1999 with a severe wheat allergy (which later was upgraded to celiac disease) and told to avoid all products containing wheat, one of the few resources we found to help us navigate our new wheat-free world was Carol’s book, Wheat-Free Recipes & Menus, first published in 1995. She wrote that book seventeen years ago! Needless to say, Carol was ahead of her time, although that was more out of medical necessity than anything else. She discovered she was gluten intolerant a few years before she tackled writing her first cookbook. Ironically, her journey to internationally known, gluten-free cookbook author (10 cookbooks) started on a wheat farm in eastern Nebraska where she grew up. To add a touch more irony to the story, she married a wheat farmer. Don’t you love life’s twists and turns? But, all’s well that ends well. Carol’s family hasn’t abandoned her for making a successful career out of avoiding wheat and the gluten-free community has benefitted greatly by her efforts. • Leave a comment on this post listing your top 3 favorite green vegetables. Green veggies only and you must list 3 choices. • Make sure you include your email address when prompted to do so (it will only be visible to me) so I can notify you if you win. • The contest closes on Friday, May 18th at 6 PM. My 5 year old neighbor next door and I will choose our favorite answer (remember 3 green veggies). That’s it! Good luck. You’ll love this cookbook. Peace, love, and green veggies! This entry was posted on Monday, May 14th, 2012 at 1:49 pm	and is filed under Celiac & Gluten Intolerance, Gluten-Free Recipes. You can follow any responses to this entry through the RSS 2.0 feed. You can leave a response, or trackback from your own site. Make the other two peas and green beanies! Easy! Kale, broccoli, and snap peas! YUM!! My favorite green veggies are raw spinach for a green smoothie, sugar snap peas and broccoli. Without our green veggies where would we be? But how do I narrow it down to three!? Toss in spinach as well and I feel quite elated. My favorite green veggies are Spinach, Broccoli, Green Beans! Brussels sprouts, broccoli, and asparagus! Yummy! My all-time fave green vegs are Spinach, Brussel Sprouts and Asparagus. I just made a frozen crunchy smoothie with spinach, crushed ice, fresh squeezed lemon juice and sea salt… a surprisingly delicious treat!